Tarja´s comment: "This is very extraordinary image with double tracks of the Sun. The first one starts from the left part of the image and passing over the top edge of the image and the end is seen in the right edge. The second movements of the Sun are seen behind the houses. I don´t know the reason for it. If you have any explanation for it I would like to know it. The light of the parking cars are seen white and yellow short lines in the both sides of the street. There is too much reddish in the image. Probably too reddish comes from the emulsion of the paper I have set inside the can. I tried to reduce reddish in the Photoshop but in vain. The third thing is a question I wondered: Why are the colours of the the Sun in so different colours?. Does it come from pollution or different colour temperatures or both? 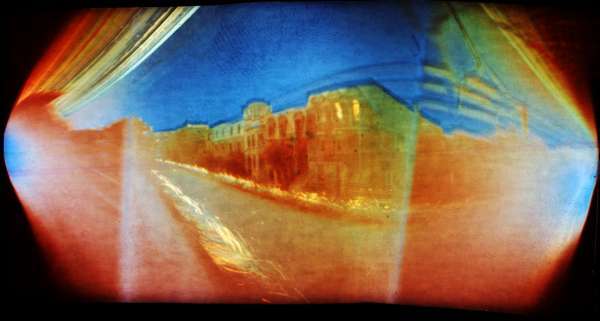 The solargraph is interesting in many ways."